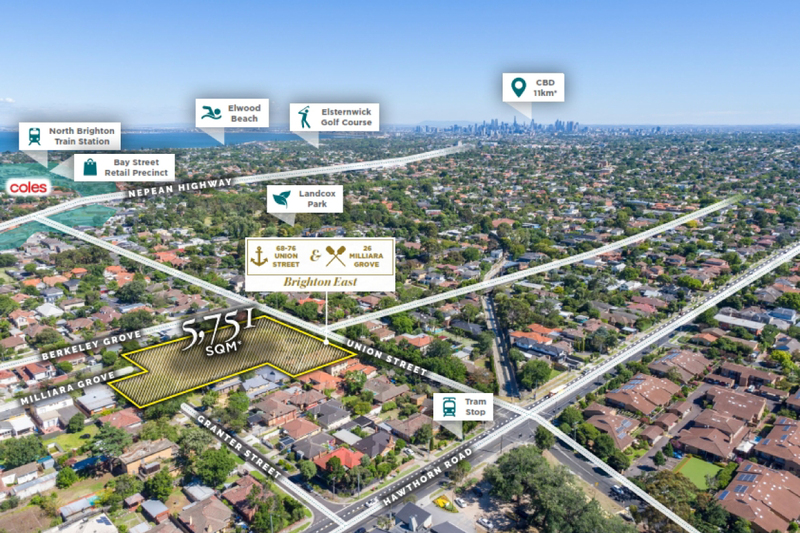 A bayside Melbourne land development site in Brighton East has been relisted with price expectations around the $19 million mark. The large, mainly vacant land parcel has come to market, as development propositions in Melbourne’s south-eastern suburbs become increasingly popular among commercial buyers. The property spans 68-76 Union Street and include 26 Milliara Grove, representing a 5,751sq m premium bayside development site. Savills Australia’s Julian Heatherich, Clinton Baxter and Benson Zhou have been appointed to manage the expressions of interest campaign on behalf of a private local vendor. “There is an approved Smith & Tracey Architects permit in place for an aged care facility, consisting of 124 beds across three levels – but the site has obvious appeal for a luxury residential development,” Heatherich said. The property’s central Brighton East location is within close proximity of “every conceivable amenity”, including the Bay Street shopping precinct. “The popularity of the area is underpinned by its thriving café culture, surrounding first-class education facilities, boutique retail amenities and beachside lifestyle,” he said. Heatherich said opportunities to secure versatile development sites within Melbourne’s blue-chip suburbs were becoming increasingly scarce. “Similar recent listings and transactions have been yielding hundreds of enquiries and multiple offers, with developers fighting to secure an opportunity to purchase,” he said. The listing comes on the back of several deals in the Brighton area, including Savills’ sale of Brighton International Reception Centre for just over $20 million late last year. “Brighton East has long been considered one of Melbourne’s premier suburban locations, and there is currently an insatiable appetite for housing in all forms right throughout the suburb,” Baxter said. Baxter said Brighton East’s high median house price, relatively low number of competing projects, and high demand for premium housing made it one of the most sought-after development precincts in Melbourne. “The 2018 population forecast for the Bayside municipality is 105,566 people, which is predicted to grow to 118,650 by 2036, reflecting a 12.34 per cent increase and generating much stronger demand for housing in the years to come,” he said.